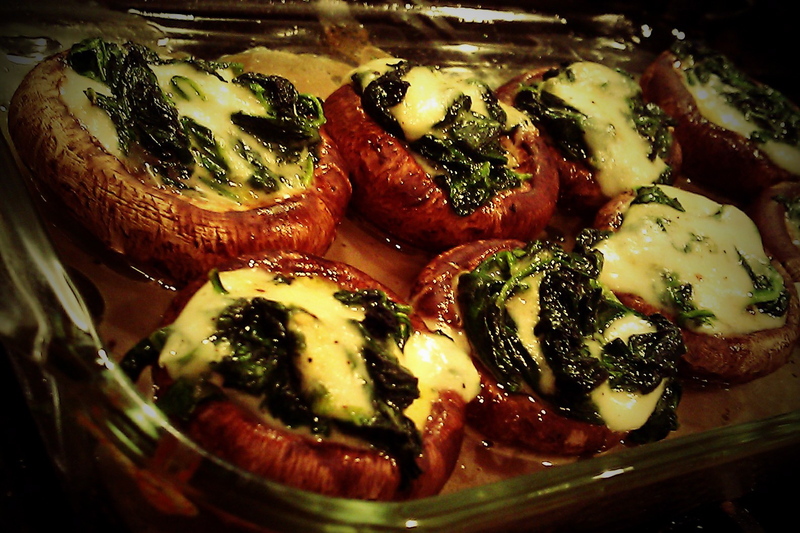 Place mushrooms in a greased baking dish. Use a little olive oil to grease the dish. In a large skillet heat oil on LOW and cook garlic until it begins to brown. Add the spinach and stir until it begins to cook. The spinach will look like a lot at first but as it cooks it will get smaller. Add the mozzarella and mix in with spinach until it just begin to melt. Do not liquify the cheese. When mozzarella is soft (slightly melted) turn off heat and spoon the mixture into each mushroom cap until all the mushrooms are filled and place back on baking dish. I make this dish quite frequently and absolutely love it!. Easy and delicious. Forgot about these mushrooms. I have to make these again! Love these & make something very much like it but I marinate the mushrooms first for a little added flavor – not that they need it, just for a change. I love change my italian flavoir. this is a very good idea. Spinach and mushrooms are a very good combo. Yum! thank you! they were a hit at the dinner table. I so bet they were…will try to make them, too.